“One of my contacts in the car industry gave me an early heads up that a Jaguar XKR Convertible was being traded in as he knew I was on the look out. As I’m quite particular about my cars the vehicle would have to have been pretty much perfect even though it was the exact model and age I was looking for if I was to consider buying it. When I first went to test drive the car, even before the dealer had given it a wash it was obvious the car needed more than a little TLC. In fact, I wasn’t sure it could be restored to close enough new condition and my satisfaction. 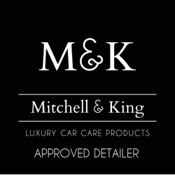 So, I asked Glyn O’Donnell from Elite Detailer to take a look at it pre-purchase and to provide an evaluation of the work that needed to be done. Glyn went to see the car the following day and produced a detailed list of work that would have to be done. He advised me of the aspects that may never return to a high enough standard and left no stone unturned. Taking all of his points in to consideration I decided to go ahead wit the purchase and hand the car over to Glyn to work his magic. Glen spent at least 3 days on the car detailing every square inch from inside wheel arches and engine bay to a complete restoration of the hood. All of the work he recommended I agreed to and I am so pleased I did. Having taken delivery of the car today I can honestly say it looks as good as new, inside and out. Whilst the car is genuinely transformed from the vehicle I originally test drove, the paintwork is is the biggest standout with no signs of the swirling or excessive tar spots all over. Hi Glyn and thanks again for helping us find the Alfa, your brother-in-law has done a wonderful job of the paintwork and with the money you saved us, we have decided that we would like you to go ahead with the cleaning you showed us in your portfolio. Dear Glyn, many thanks again for attending the garage with me to check over the new Porsche. You will be pleased to know I now have a confirmed date for delivery of the replacement car and for the record I think you were right to make me refuse the first car as I don’t think I would have ever been 100% happy with it. I will drop you a line when the new one arrives as i would like the paintwork protecting. The work is professionally undertaken with attention to detail and obtaining an excellent finish is the clear priority by an individual who is polite, pleasant and punctual. It is for those reasons that I have become a longstanding customer. When the work is finished the car reflects the house clearly as though it is a mirror. Glyn has been detailing my cars for several years now and due to my busy schedule I sometimes need to literally leave him the keys and disappear. Upon my return the car is always presented in an unequalled passion, parked correctly, secure, protected by its cover and clean beyond perfection. My pride and joy is left with the upmost of trust for the service Glyn has given to the prancing horse. I would reccomend his eye for detail to anyone. Just to let you know that my Supersport has just sold for £39,500 – a record I reckon, certainly for one with more than 100k on the clock. The standard you prepared it to was a significant factor in clinching the deal – if you ever need a reference you can have one from me. Thanks again – and if I get another project car I’ll be in touch.